【DOUBLE HAMMOCK WITH TREE STRAPS】All accessorie are in one bag. Capacity:660lbs. Size:118″x79″. Best hammock for family camping. The straps are very strong and they will not stretch out. Move the included 2 carabiners to any one of the loops to attain the perfect height and comfort level. Each strap is 9 feet long with 14 loops on each strap (many adjustments). The straps are stronger and much more portable, which holds 1000 pounds. 【QUALITY YOU CAN CRASH ON】Made of high quality 210T parachute nylon materials (the same kind skydivers and eno hammocks use!) )and special designed durable bug net fabric(2 times density than similar products on the market). This lightweight portable hammock is designed to accommodate even your most demanding camping needs. 【ONE DURABLE MOSQUITO NESH 】Equipped with 2 mosquito net ropes of 6 meters(20ft) long, can be a good lifting mosquito nets.It will not sag so that can give you a separate personal space. Avoiding mosquitos disturbing, really enjoy the nature in the rest of the time. 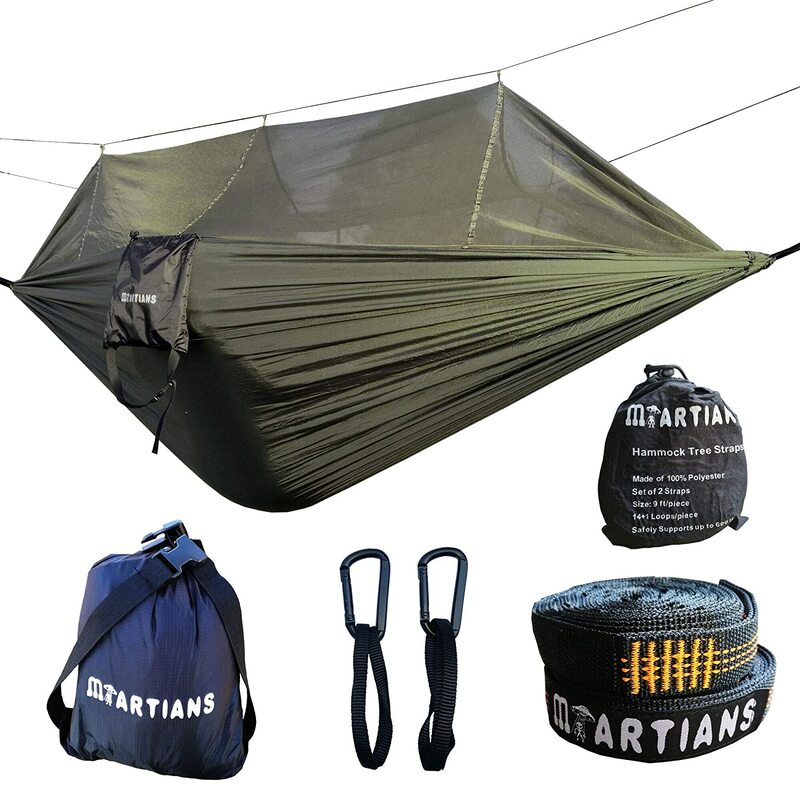 The parachute hammock can be flipped over and used conventionally. 【LIGHTWEIGHT & REVERSIBLE】Just Flip To Use As A Regular Hammock. This is a professional outdoor hammock, suitable for all outdoor people, through continuous upgrading and improvement, more compact structure, lighter weight, more functional, more solid material. Suitable for: outdoor camping, garden leisure, fishing, etc.